It’s not often a person takes the mundane job of washing dishes and writes about it. My 6-month dish washing stint was much different than scrubbing pots and pans at a local diner. I was employed at a high-security Army installation 12 miles from the heart of Anchorage. From my vantage point on clear days I’d see not only the city, but Sleeping Lady, Redoubt Volcano, and Mt. Denali. Several hundred feet below my stainless-steel sink, nuclear warhead missiles were ready for launch. After graduating from high school in 1972 I searched for work to help alleviate an often empty wallet. For the most part I needed cash to spend on gas. 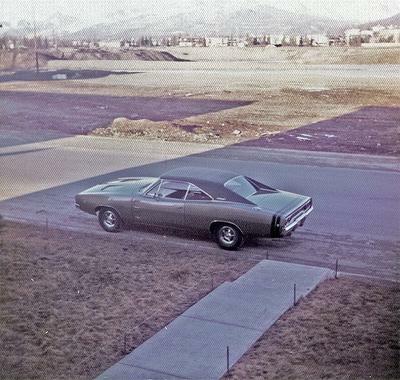 My 440 4-speed 1968 Dodge Charger R/T was a thirsty puppy. Dad knew a guy in charge of a civilian maintenance company. The business contracted out services to the military such as kitchen and dining room upkeep. The mindless detail included dish washing. When first told of the job I wasn’t interested. It seemed a boring way to spend my summer. When dad mentioned I’d work at a nearby Nike missile site my interest level exploded. Turning in the application, a minimal background check was quickly passed. Within days I was happily employed. My unofficial title was Civilian KP; the KP standing for kitchen patrol. 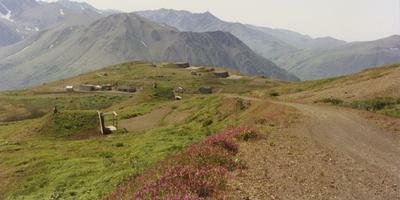 Site Summit lies northeast of Anchorage at the 4100 foot level of Mt. Gordon Lyon. The mountain’s named after the man who helped construct the missile complex on top. Gordon Miller Lyon oversaw military projects throughout Alaska. The innovative engineer from Iowa died January 16, 1964. He’s buried in Anchorage Memorial Park Cemetery. Site Summit officially started construction in 1957, going online in 1959. Its official military designation was B-Battery. The B stood for Bravo. Nike-Hercules missiles were part of a Cold War effort to place a ring of protection around the United States. They were a detriment against possible enemy attacks. At one time there were 393 such facilities throughout the world. By 1972 Nike was winding down. The line of sight defense system was totally antiquated and offline in 1979. When I was hired, specific areas were identified as off limits. A sign at the beginning of a hallway leading from the ‘Day Room’ boldly proclaimed: NO UNAUTHORIZED PERSONNEL BEYOND THIS POINT. That warning needed no explanation. The ‘Day Room’ as it was called was next to the mess hall. Pool tables, couches, and seats of comfort were provided for troops. I got to know both areas up close and personal at the end of a vacuum and mop. My KP teammate was a young man named Don. He was an amicable character and we got along well. Don had long hair so he was called ‘Hippie Don’ by Sergeants Johnson and Ingalls. These 2 enlisted men were our supervisors. They were good people but didn’t cut us any slack in the work department. If grease or food residue was left on plates, cups, or pans we were barked at. For extra cleaning power hot steam was pumped into our rinse water. We wore thick rubber gloves while handling utensils because steam would instantly burn skin. I’d never seen anything like it. Dish washing at Site Summit was definitely a hazardous occupation! Don was popular with many of the lower ranked personnel. He’d supply them with extra food unbeknownst to the sergeants. I learned to follow suit. Three times a day an olive green pickup truck backed up to our kitchen loading dock. We helped load meals for those crews working the control area or missile launch facilities. Before the truck left we’d toss in extra snacks or fruit. That act of courtesy never failed to get thumbs up. 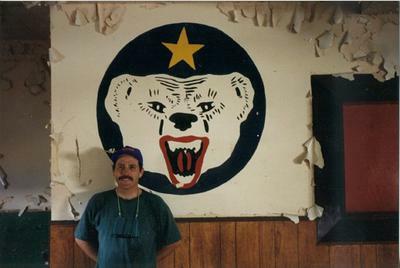 B-Battery’s mess hall had a reputation as serving some of the finest chow in the Army. I found this to be true. On 2 different occasions top brass flew up strictly for meals. Whenever bigwigs were scheduled to arrive, Sergeant Johnson instructed us to make sure kitchen and dining room floors were spotless. There were 2 security gates on the mountain. One was on the main road where I had to stop and check in. 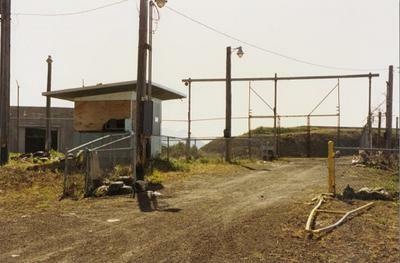 The other gate was at the control and launch areas. Two fences separated this second gate from the road. I was told more than once should an unauthorized person ever breach the fence, they’d be shot on sight. I suppose manning checkpoints was probably the most boring of all military jobs. Security dogs were also used. On occasion I’d see handlers walking German Shepherds on leashes. A road to the top of Site Summit is carved through solid rock in some places. It subjected vehicle tires to terrible punishment. My 375 horsepower Dodge went through a set of soft rubber Goodyear’s, plus upper and lower ball joints in 6 months. Wash board ruts were common after rain. One rainy day as I slowly drove up the hill, Nike missiles were out of their compounds in full display. The birds were tilted upwards ready for flight. That’s the only time I ever saw them. It was impressive! At the start of each day Sgt. Johnson and Ingalls would huddle in their little office smoking cigarettes and drinking coffee. One morning I yelled, “Ten Hup!” just for kicks. The 2 soldiers couldn’t stomp their smokes out fast enough while clambering out the door. One of them spilled coffee in the process. After finding they’d been pranked the sergeants were none too happy. “Don’t ever do that again!”, Sgt. Johnson sternly warned me. Minutes later he saw the humor. Sgt. Ingalls owned what I believe to be an Opel Kadette. It was a much smaller car than my Charger. The Mario Andretti wannabe drove it like a sports car. On more than one occasion ‘Sarge’ came up from behind passing me. I didn’t like thrashing my vehicle so I just putted along. When I walked in the kitchen afterwards Ingalls would be grinning from ear to ear like he’d just won the Indy 500. The soft spoken sergeant claimed to set a record for driving to the top of Site Summit. I knew I could top it. Prearranged with the gate guard on not having to stop, Don and I blasted up the hill early one morning easily beating Ingall’s time. Extra horsepower made it a snap. One day Sgt. Ingalls and I left work at the same time. He was in front of me going down the hill like a jack rabbit. I dogged him all the way. At the bottom of the mountain ‘Sarge’ spun out. All I could see was a huge cloud of dust. I thought he’d rolled but luckily his car remained upright. Next morning I was the one wearing a smile. I don’t recall Sgt. Ingalls ever racing me again. After that I was warned about speeding on military installations. To this day I believe my Dodge Charger set the quickest time from Arctic Valley Road to the top of Site Summit. One slow afternoon Don and I were in the Day Room talking to a couple of GI’s. The men had something they wanted to show my partner. I was invited to tag along. Don and the 2 privates breezed by the warning sign like it didn’t exist. Evidently my co-worker had done this before. I was reluctant to enter yet out of pure curiosity didn’t turn back. Glancing into a room with glowing radar screens I saw a soldier in green fatigue bottoms and white tee shirt. The fellow had both legs comfortably resting on a console while reading a comic book. That sight’s never left my mind. The soldiers took Don and I to their dorms. They were small yet comfortable places to sleep. There wasn’t much space to visit. I immediately saw why the Day Room on Site Summit was important to personnel. It was the largest social gathering spot on the mountain. Don called my house one evening saying not to pick him up. My compadre’ glumly remarked he’d been discovered in an ‘off limits’ area by the lieutenant. “Hippie Don” was sent down the mountain to work in Fort Richardson’s kitchen. No Civilian KP ever wanted to work on Fort Rich. Horror stories were rampant about all the pots and pans to be scrubbed at that location. I remained on Site Summit until the first snow. Seeing it was going to be tough driving up and down the hill I turned in my resignation. Soldiers told me it wasn’t unusual for workers to be trapped on the mountain during a storm. That didn’t sound like something I wanted part of. In September I started Automotive Technology classes at Anchorage Community College. I often think back to working on that mountain. In 6 short months I created memories unobtainable anywhere else. Some of my former classmates worked fast-food right out of high school. I feel blessed in having washed dishes in perhaps the most scenic of all Alaska locations. The pay was lousy, yet visual sights were something never equaled working at Burger King or McDonalds. Twenty years after my dish-washing career, I finagled unofficial permission to ride my bicycle to the top of Site Summit as well as hike there. Doing so completed 2 items on my ‘bucket list’. My son Gunnar went along as did brother-in-law Calvin Freeman. No official race was declared but I managed to be first one to the top on my bike as well as the hike. Site Summit competition still circulated in my veins. Things had drastically changed by then. The facility was in a state of total disrepair. I took numerous photographs for posterity sake. Thankfully some of the soldier’s Nike related artwork had survived. Going back down the hill I let ‘er rip. I wish Sgt. Ingalls had been there to watch. On a Rock-Hopper mountain bike I absolutely smashed his long-standing record for fastest descent. Check out this fun story, Village in the City right now. Comments for "Race to the Summit"
I met my ex at C Battery across the bay. She was a KP. I was an MP 78-79 and was there when we closed the sites in 79. I spent the last half of 1969 after I returned from Vietnam as a security guard with the Army at the entrance gate. I drove my 64 GTO up that hill every day from Spenard where I lived with my parents. Since I was local I didn't have to live in the barracks so it was like a regular job despite the Nike missles. My father, Ray Dougherty was a heavy equipment operator. He was offered a job running the bulldozer that cleared the land for the missile site. My dad turned the job down because the grade was so steep and dangerous. Sadly, the man who did take the job was killed when his bulldozer rolled over on the hillside. I attended Clark Junior High and we were brought outside the school to witness the first missile launch from the site.